My mom has had me on a strict “baby friendly” diet ever since Surya arrived. There’s a whole laundry list of foods that should apparently be avoided while nursing. The list is in part derived from the internet and by way of word of mouth from my aunties in India. I’m just thankful to have my mom cooking for me so I haven’t really complained much. Plus, Rajat and I are a big fan of whatever might help keep Surya calm during the night. Potatoes sadly made their way onto her list of no-no’s. 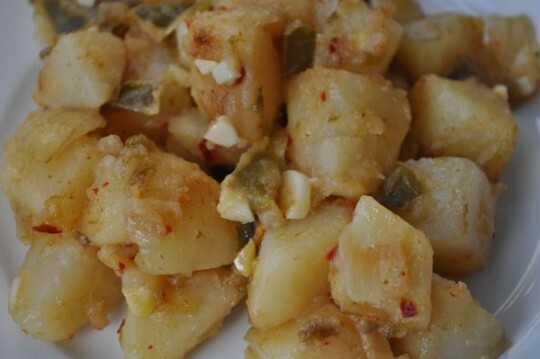 So please, for me, have these skillet potatoes with mojo de ajo this weekend. For the last few months, I’ve been doing two new things. One, I’ve been eating breakfast at home. <Baby, you’re welcome.> Two, I’ve been reading cookbooks and cooking magazines while I eat breakfast. An odd way to start off the day? Maybe. For some. But I love it. It helps me brainstorm ideas for dinner. Although I’ve been told that it’s abnormal to think about dinner before 10 am. I find this hard to believe. What time do ‘normal’ people start thinking about dinner? I am almost always thinking about dinner. Or lunch. Martha Stewart Living from June 2009 kept finding its way into my breakfast reading rotation. And I kept going off to work salivating over Martha’s description of mojo de ajo, a garlic oil sauce with lime juice and hot pepper. Martha’s recipe is for making mojo de ajo to top off chicken fajitas. I contemplated concocting vegetarian fajitas with mojo de ajo but honestly I’m too lazy for fajitas. The at-the-table-self-assembly process is too much for me. So, I made a batch of mojo de ajo and drizzled a generous amount over potatoes that had been cooked until they were melt-in-your-mouth soft with green bellpeppers and onions for an earthy balance. Be forewarned – mojo de ajo’s garlicky-lime-chili pepper kick is addictive. You can use the leftover mojo de ajo in other dishes. Try it as a salad dressing or, if you’re not anti-fajita like I am, fire up some veggies and tofu or Morning Star Vegetarian Chick’n Strips and drizzle them with mojo de ajo. If you are anti-fajita, roll it all up in a wrap and call it a day. 1. Make the mojo de ajo: In a small saucepan, heat the oil and the garlic for about 8-10 minutes on low heat until the garlic is soft. It should not get browned. Remove from the heat and allow to cool for a few minutes. Stir in the lime juice, red chili pepper flakes and salt. 2. In a deep skillet, heat oil on medium heat. Add the onions and bell peppers and cook until the onions and bell peppers soften, stirring frequently to keep from browning. 3. Add the potatoes and mix in with the onions and bell peppers. Cook covered on medium heat for about 15 minutes until the potatoes are softened. Test with a fork. 4. Drizzle the mojo de ajo over the potatoes and stir well to coat all of the vegetables. Taste for salt and adjust as needed. Add more mojo de ajo as needed. Serve hot. I think about dinner when I get up too! Or sometimes the day before! Potatoes are such wonderful comfort food and yours look delicious! I’m glad to see that I’m not the only with food constantly on her mind! @Shirin – thanks for the tip 🙂 I’ve been cheating a bit now that my mom has left. Indians believe that garlic actually helps stimulate milk production while I think other cultures put it on the list of no-no’s. Just goes to show that as you said, you can eat whatever you want (you can probably find at least one group out there will say it’s good for you!). @Vinita – glad that you enjoyed it. Weathered picnic table and bottles of beer sounds like a great meal. These potatoes definitely look delicious! I had to laugh at your reading cookbooks at breakfast- as I did it every day this week too! I will certainly have this dish for you, I love a good spicy potato dish. I will just need to pick up a green pepper and I’m all set! This dish was divine. I paired the potatoes with short grain brown rice and a fruit salad. Preparation and cook time took me over an hour, but the final presentation on the weathered picnic table with two good bottles of beer was perfect. P.S. I am breast feeding at 19 months and the baby is happy with garlic and chillies. Gosh, Nithya, YUM! That garlic oil has gotten my tastebuds all tingly, and with potatoes it must be bliss in a bowl! This is the second time this week that we have made these potatoes. I don’t think I can have them any other way from now on. Each time we also made a side of yellow corn grits with pepper jack cheese. i tried mojo de ajo on morningstar farms chick’n strips and made fajitas. they turned out great! (btw, i never knew you were anti-fajita-making!) mojo de ajo is definitely addictive though – i’m trying to figure out other ways to use it. @Raj – I need to replenish my stockpile of corn grits. Sounds like a great side to these potatoes. @Lalitha – Let me know if you think of any other ways to use the Mojo De Ajo. I have some of those strips in our oven so I’ll give it a shot…maybe put them in a wrap (I used to be anti-wrap too!). Making the sauce now, for fajitas tomorrow (quorn “chik’n tenders”, peppers and onions). I’m sooo excited, as I’ve been dreaming about the mojo since you posted. It would be great on yucca, too! As for breastfeeding, eat it all! I ran into trouble only twice: once when I ate tons of pickled peppers from NYC’s Pickle Guys over the course of a couple days and another time when I ate about half a bunch of asparagus right off the grill! These potatoes were a hit! I live with 2 picky eaters and they were the first to finish this dish! Thanks agian for sharing! This is definitely something I will be making more often. p.s. potatoes in mojo de ajo paired with daal chaawal is completely divine! @sumera Thanks for the comment and the feedback. I’m so happy to hear that your picky eaters liked these potatoes. Interesting to pair it with daal chaawal. I had not thought of that! I loveee skillet potatoes and u make them soo delicious here! Happy to find ur blog!